An unprecedented event took place at Disney World, all for the purpose of announcing another upcoming Disney Event that will happen simultaneously on both coasts at both Disney World and Disneyland. 140 Disney Characters Together At One Time! There have never been this many Disney Characters together at one time. The only shame is that it happened while the Magic Kingdom was closed and the public didn't get to see it in person! Disney Fans should click on the above picture and zoom in to see how many of these characters you can name. Mickey Mouse and Minnie Mouse are easy to spot in the front, but there are a lot of other characters that are rarely seen in the Disney Parks anymore. Besides Disney Princesses aplenty, including Elsa from Frozen, there are 7 Dwarves, Winnie the Pooh and friends from teh 100 Acfre Wood, Robin Hood, Fairy Godmothers, Chip n' Dale, Mary Poppins, Mulan, Jungle Book Characters, Flik from A Bug's Life, Alice in Wonderland and friends, Villians from every corner of Disney lore, and even Dumbo! There are many more to find as well! 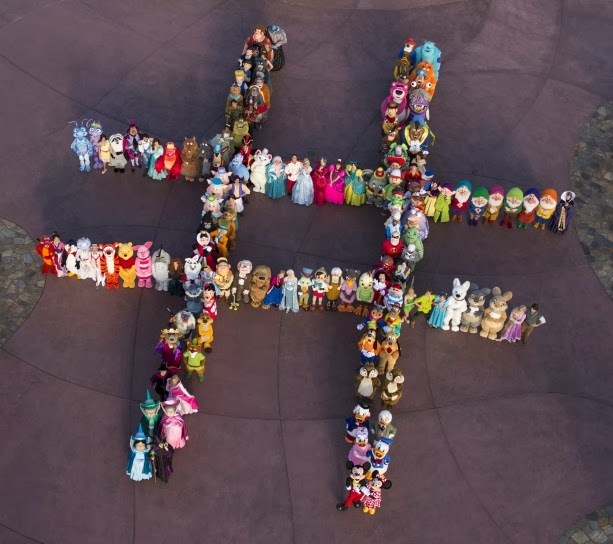 So why are 140 Disney Characters all standing together in the shape of a giant Hashtag? The answer is simple to make a special announcement on Twitter on an upcoming event that will happen during Memorial Day Weekend 2014. Returning again this year is the popular 24 hour straight celebration that both the Magic Kingdom in Disney World and Disneyland celebrate at the same time. The 2014 version is called "Rock Your Disney Side" and it promises to be a fun event! The event takes place starting 6 a.m., May 23 to 6 a.m., May 24, 2014, local time. The theme this year is good vs. evil and special entertainment and meet and greets will be set up across the parks. Another special opportunity for Disney Guests is the fact that guests will be allowed (and encouraged) to wears costumes and dress as there favorite Disney Hero or Villains. This is an opportunity that usually is reserved for the MNSSHP (Mickey's Not So Scary Halloween Party). So which excites you more the Announcement or the Event? Does seeing 140 Disney Characters together top the "Rock Your Disney Side" event? We would love to hear your comments! 0 comments to "140 Disney World Characters Come Together For Ultimate Tweet"